January 2013 - Concert Manic! I’m not entirely sure what “Border Music” is supposed to be, but judging from the music I heard that night, their definition seemed to be pretty fluid. There was a lot of Latin music – unsurprisingly, given Hidalgo’s background in Los Lobos and the Latin Playboys and Ribot’s Cubanos Postizos – but there were some other selections that were a little less clear on where they fit in to the concept. I’m sure that if I had a chance to ask, they would have had fascinating explanations of which borders those songs would be straddling. The equipment on stage was intriguing me even before they started playing: two electric guitars, three acoustic guitars, a cello, and a ukelele. There was, needless to say, a lot of tuning going on throughout the set (along with the obligatory “we tune because we care!” jokes and one or two “shouldn’t we have roadies for this?” comments). The next song was The Dying Cowboy, a song that Marc Ribot has recorded more than once – most recently on Buddy Miller’s Majestic Silver Strings album. He talked about his unusual arrangement of the song in an interview with the L.A. Times: “I was surprised at the dirgy, depressing, very non-cowboy chords of this version/arrangement. Pretty soon I figured out that I was misreading it (chalk up another one for Harold Bloom). In contemporary [musical] notation, a minus sign means minor chord; in the 30’s, it meant dominant 7th, a completely different vibe. But I liked it so much that I kept it minor, more or less threw out the original melody (ah, it’s good to be an American!) and turned it into a kind of free-jazz cowboy raga.” The “Border Music” interpretation of this was a haunting duet with two acoustic guitars and Ribot doing the vocals in a more-or-less spoken-word style. Really lovely. I’d meant to see a concert or two over the long weekend, but was unfortunately sidelined by the flu – so instead you’re getting a look at some upcoming concerts and tours that I think are worth checking out. Bettye Lavette – one of my favorite voices on the planet and a consummate performer, Bettye has a few dates scheduled in Australia (Byron Bay, Sydney, Melbourne), Cape Verde, and the U.S. (Pittsburgh, NYC, DC, Chicago). If you haven’t heard her before, click here to listen to one of the performances that made her famous. The Preservation Hall Jazz Band is touring all over the U.S. from February until May – including a visit to Brooklyn Bowl where I had such a good time seeing them last summer. If you get a chance to see them at a standing and dancing kind of venue, don’t miss it! I’m honestly not sure about other kinds of venues – I saw them at Boston Symphony Hall and it was kind of underwhelming, but I think it was in large part due to some sound problems they were having that night. The Underscore Orkestra – who I’m recommending simply because I saw them one time and it was so much fun – are currently doing an Australia/New Zealand tour, and will be doing a U.S. tour in March. Listen to some of their music here. I remember their live performance as being much more exciting than the studio tracks would indicate, though. My first concert of the year was a big one – three popular local bands, all touching on the klezmer/circus/gypsy music family. We are blessed with a lot of that sort of music here in Boston, although I’ve never really known why. Whatever the reason may be, in my opinion it’s a very good thing! The show was at Johnny D’s in Somerville, where I hadn’t been in ages. They recently changed their ticketing system for the worse, unfortunately. You used to be able to buy a ticket online, then call to reserve a table, where you could eat and drink as much or as little as you felt like. With the new system, if you want to get a table reserved, you have to pre-pay for $12 or $20 worth of food, which must be ordered from a limited prix fixe menu. This can make things considerably more expensive, especially since you have to pay fees on the food prepayment amount. On the plus side, Johnny D’s is a pretty decent place to see a concert: the sightlines and sound are both good, and the food is better and less expensive than a lot of similar concert venues. I figured I’d start my first real blog post with a look back at the year that just ended: 2012. It was a pretty epic year for concerts! Here are a few of my highlights. The first concert of the year was in a small venue in my neighborhood, Lilypad. John Medeski played a solo piano concert (and I think everyone involved is probably still wondering why he picked such a small venue – it only seats about 60 people). I had an amazing seat – right next to Medeski, with a perfect view of every key he pressed. It’s really special to see a real virtuoso from that vantagepoint. You can actually watch and listen to the entire concert here – the person sitting next to me at the show combined both of our video footage with another friend’s audio recording to come up with a complete concert film. Later in January, I saw Joe Henry for the first time – two nights in a row at City Winery in New York City. 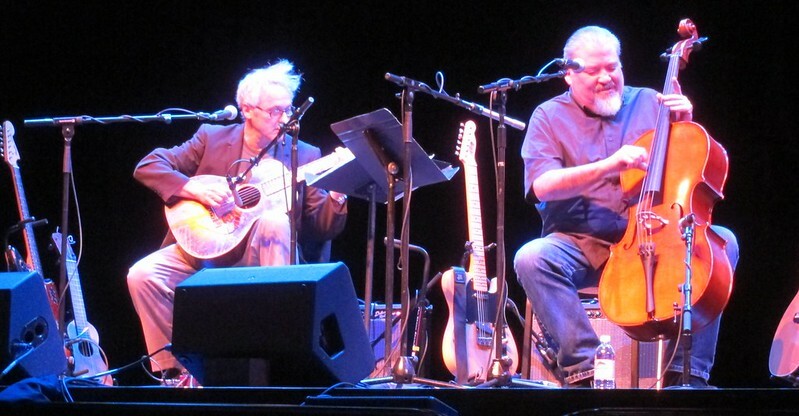 I lucked out and he asked my favorite guitarist, Marc Ribot, to join him for those two nights. Ribot also performed a short opening set. The undeniable highlight was a performance of “Tomorrow Is October” from Henry’s latest album, Reverie, in a stripped-down arrangement for voice and two guitars – Henry on acoustic and Ribot on electric. Much more beautiful and striking than the studio version, as much as I like the original. In the spring I had the good fortune to catch the Underscore Orkestra, who describe themselves as “playing a blend of Balkan, Klezmer, Gypsy Jazz and Swing.” That was one of the most fun shows I saw all year, and I’d never heard of them before so it was a great surprise. They are currently on tour in Australia/New Zealand and will be on a lengthy U.S. tour later in the spring. Keep your eye on their tour page to see if they come your way – highly recommended! Hey look, I’ve started a music blog! I’m planning to focus on concerts – concert reviews, giving you a heads-up on tours, things like that. Also, if you have anything you’d like to contribute, I’m all ears! Concert photos, reviews, maybe even a blog post on concerts from the musician’s point of view. As long as it’s concert-related, I’d love to see it. If you have any suggestions about the type of posts you’d like to see here, let me know in the comments!